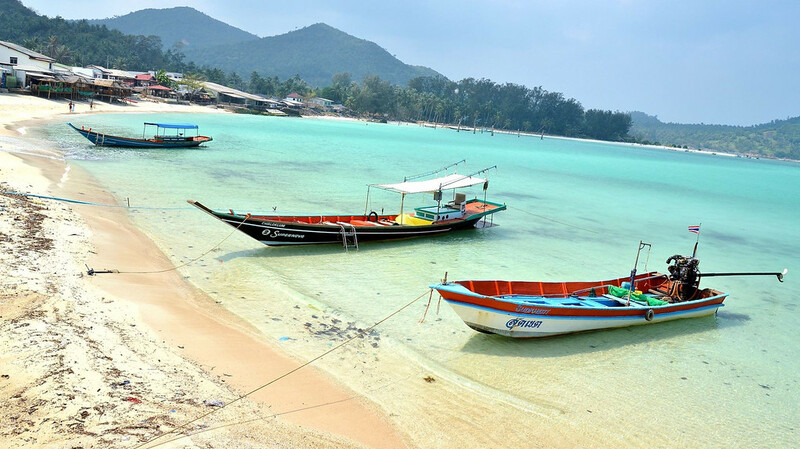 In the northern sector of Koh Phangan is Chaloklum, a fisherman’s village that not too long ago became a very popular spot for diving. This beach village is quite a ways away from the happenin' party towns on the opposite side of the island. One can assume that the majority of Chaloklum's inhabitants chose to live or stay here because they prefer a quieter environment and value a more peaceful and private setting for their home. Many of the foreigner that have been on the island for several years end up staying here. Luxury villas, houses are bungalows are available for those that plan to stay for longer. The rest of the homes are occupied by the local Koh Phangan (born and raised) Thai fisherman families and a growing community of expats (resident farrangs), yogis, and artists of all kinds. This is a great choice of which beach for people that desire a quieter setting…like, for the ones that have a business online and work from the comforts of their home, or maybe for an author who needs silence in order to focus clearly and write away. The beaches of Chaloklum are an ideal place for water sports and activities that are in favor of calm waters. There is a wide variety of alternatives to keep people of all ages going with activities like snorkelling, kite surfing, wakeboarding, water-skiing, and jet skiing, to name a few. A three meter long shoreline forms the perimeter of the bay with its trail of beachfront private bungalows, resorts, beaches, restaurants, and more. There are many yoga, detox, and meditation schools around here as well for those going down a more spiritual path on thier Koh Phangan adventure.